According to the World Health Organization (WHO) “Cancer is a leading cause of death and disability globally, impacting more than 14 million people each year.” Consequently, prevention is the best option available for these noncommunicable diseases (NCDs) era. Part II of The Truth about Cancer deals with cancer diagnosis, detection, causes, and prevention. Herbal remedies, Detoxification, and Diet. Sound, light, electricity, Frequency and Heat. Treating Cancer with Viruses and Essential Oils. 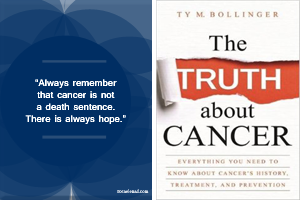 The documentary The Truth about Cancer: A Global Quest covers more information, and the visuals make it more powerful than the book, but still the book is useful as a quick reference guide. The Truth about Cancer has a Facebook account and a web page for more information. *Considering a clean diet, besides what the book presents, my first resource about diet is from Dr. John McDougall, Dr. Neal Barnard, and Dr. Caldwell Esselstyn.